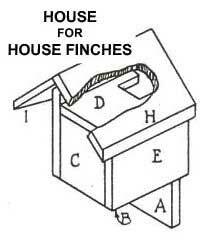 Free plans to build a house finch bird house.The bird house can also accommodate wrens. House Finches are early nesters, beginning their parental journeys as early as March. They also breed two to four times during the year, so they certainly need homes that they can enjoy the entire breeding season! Gregarious and noisy, House Finches are seed-eaters and particularly like small black sunflower seeds. House Finches aren't real picky about their nests, and they will re-use abandoned nests, build a nest on a window ledge, hole in a building or even in a heavily ivy-covered wall. This bird house is perfect for the prolific finches, as well as for wrens, which are similar in size and nesting traits. The house finch has made many enemies because of its fondness for cultivated fruits and berries. However, it has some redeeming features in its song and beauty. The nest is usually placed in the fork of a limb—evergreens being favorite nesting places. 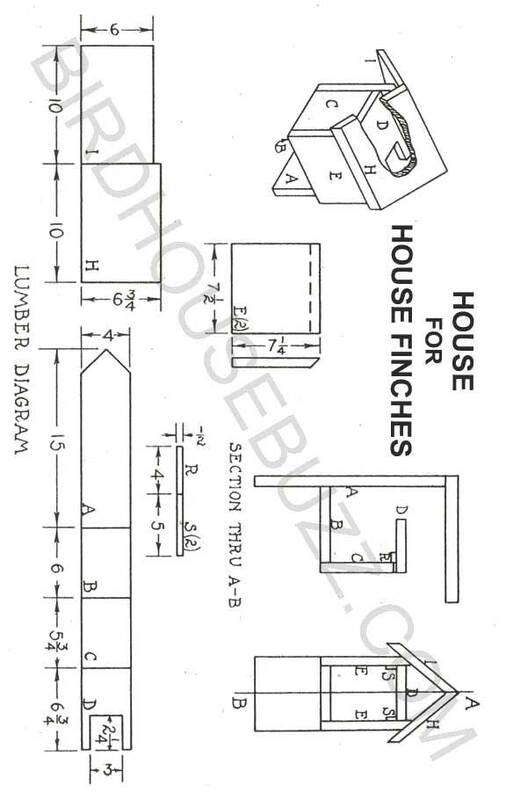 These house finch plans are suitable for these birds but is also acceptable to wrens.